Fresh off a surprise $100 million settlement in its last class action suit, Uber is facing new charges that it has misclassified its drivers by calling them independent contractors rather than employees. In a complaint filed Sunday in U.S. District Court in Chicago, Milwaukee-based attorney Brian Mahany has brought a "collective action suit on behalf of all current and former Uber drivers" in the U.S., except for those in California and Massachusetts. Drivers in those states were covered in the recent settlement, which included provisions that will allow Uber drivers to form associations and to ask for tips, but did not resolve the issue of their job classification. "This needs to be addressed on a national basis," Mahany said, adding that he had been waiting to see how the California suit turned out before proceeding in Chicago. "The way they settled, you're still an independent contractor," he said. "It doesn't deal with the classification issue. Uber has to face this sooner or later." The suit asks for the recovery of unpaid overtime wages, expenses and gratuities along with the drivers' re-classification as employees. 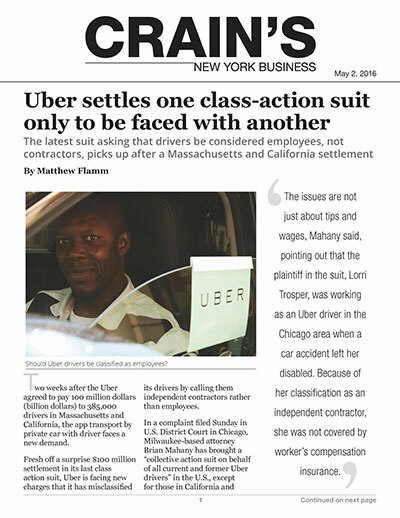 The issues are not just about tips and wages, Mahany said, pointing out that the plaintiff in the suit, Lorri Trosper, was working as an Uber driver in the Chicago area when a car accident left her disabled. Because of her classification as an independent contractor, she was not covered by worker's compensation insurance. The issue of worker's comp has also dogged the San Francisco-based tech company in its dealings in New York, where bike messengers working for its UberRush delivery service have no coverage, even though traditional bike-messenger companies are required to provide it. Uber drivers in New York City have worker's comp coverage as part of the state-administered Black Car Fund. Uber insisted that its drivers prefer to be classified as independent contractors.